The archbishop’s views carry weight. As president of the Pontifical Council for the New Evangelization, he will be a key figure during next month’s assembly of the world Synod of Bishops which, at the direction of Pope Benedict XVI, will spend October 7-28 pondering how to spread the faith today. Coming as it does in the closing days of a heated American political campaign, the synod is unlikely to attract much attention in the U.S. media, except for the faithful Catholic press. That’s a shame, since if Archbishop Fisichella is any indication, the 250 or so bishops and other Church leaders from around the world could have a pretty interesting discussion. Among large numbers of people in the secularized West, he told a new evangelization conference in Australia in August, there is little interest in religion any more and even less in the idea of a “true religion.” But it doesn’t follow that the religious instinct is dead. If that is so, then it seems to follow that the essence of new evangelization will be found in showing these people that faith in Jesus Christ is what best corresponds to their real needs and interests—at this moment and every moment. Easy to say, not so easy to do. It’s significant that soon after the synod starts Pope Benedict will inaugurate the long anticipated Year of Faith for the universal Church. The date chosen, October 11, has symbolic resonance as the 50th anniversary of the start of the Second Vatican Council. What Pope Benedict evidently wishes to tell us is that the new evangelization can only succeed through a renewal of faith among many Catholics—and that any such renewal today must be rooted in the teaching of Vatican Council II, which so many have yet to absorb. Here’s one thought about that. 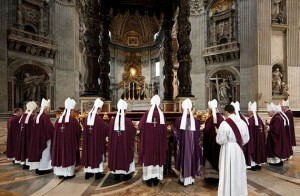 Among the achievements of Vatican II was its vision of the laity and their place in the Church. (You’ll find it in the council’s Constitution on the Church and Decree on the Apostolate of the Laity.) Departing from the old Catholic Action model that had defined lay apostolate as a sharing in the apostolate of the hierarchy, the council said that in and through the sacrament of baptism God directly summons people, including the laity, to enter into the mission of the Church. No more waiting to be asked—everyone’s been called. Much more could and should be said by way of exploring what it would mean for the laity to accept their responsibility—in partnership with their bishops and priests—in the great work of evangelization. Here it’s sufficient to say that there will hardly be any new evangelization worth the name of without them. I look to the synod to make that point. Strongly. Spiritual Food for Our Troops!